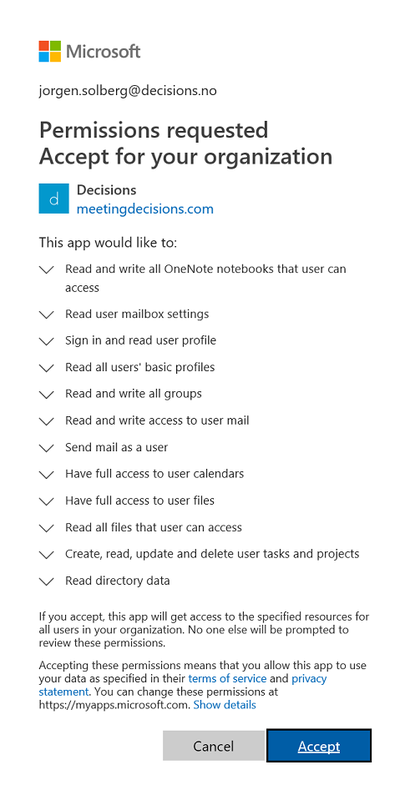 When you enable admin consent for the Decisions app, you are presented with a list of Microsoft Graph permissions. This article will help you better understand why Decisions requests them and how they are used. All permissions requested by Decisions are Delegated Permissions. Decisions acts on behalf of a user and is limited by both the application permissions and the end-user’s permissions. By using Delegated Permissions, users of Decisions will never get access to any resources they not already have access to in your organizations Office 365 tenant. The following sections detail each Microsoft Graph permission scope and how Decisions uses it. Used to set-up private notebooks for meetings to take notes and prepare remarks and questions. It also allows for group meeting minutes to be stored within their shared OneNote notebook, should the group opt to use OneNote. Used to identify a user’s language preferences. Used to sign in to Decisions. Used to display first and last name, photo and email address of group members and external participants. Used to create folder structures in the Office 365 Group’s SharePoint site for meeting agendas, related files and group conversations. Used to create draft emails to meeting attendees. Used to allow Decisions to send meeting participants notifications, such as agenda updates and links to the meeting for co-authors. Emails go to meeting participants or to the distribution list selected by the meeting owner. Used to read information from user’s calendar to enable features like the meeting list and search. It also gives the user an option to delete specific meetings from the calendar, when the item is deleted from Decisions. Used to provide users with support for personal file annotations. Annotated files are stored privately in the user’s OneDrive for Business. Used to read files that are shared with the user in order to merge those files into the PDF Meeting Book. Used to sync tasks and decisions to Microsoft Planner. It also allows users to export tasks and decisions to Excel. Used to gather basic information about the Office 365 tenant when registered, such as tenant name and verified domains. It is also necessary for verifying group memberships. Please refer to the Microsoft Graph Permissions reference for full details on what permission scopes grants access too.